Steve Bannon went — as Steve Bannon might say — "buck wild" inside a barn in Fairhope, Alabama, last night. He was there to rally support for Roy Moore, who faces incumbent Republican Senator Luther Strange in today's special election. Trump was in Alabama last week hosting a rally for Strange (the same rally at which he began his tirade against the NFL), but that didn't change Bannon's mind on which candidate to support. 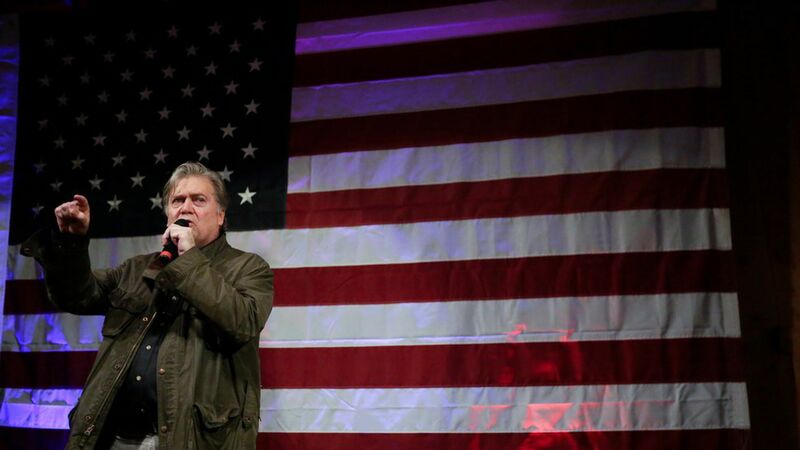 The recently departed White House chief strategist was unshaved, unkempt, dressed in a green military jacket and came out onto stage to "Street Fighting Man," by the Rolling Stones. He name-dropped Plutarch and Shakespeare, and described today's Republican Senate primary run-off in Alabama in typically hyperbolic terms. "Tomorrow's going to decide who has sovereignty in the United States of America," said Bannon, who was stumping for the anti-establishment candidate Roy Moore, who leads incumbent Sen. Luther Strange, the favored candidate of Senate Majority Leader Mitch McConnell and President Trump, by eight or so points in the polls. Things only escalated from there. "Mitch McConnell and this permanent political class is the most corrupt and incompetent group of individuals in this country," Bannon shouted. "They think you're a pack of morons. They think you're nothing but rubes. They have no interest at all in what you have to say, what you have to think or what you want to do." Amazing to think that a little over a month ago, Bannon was working in a White House that was trying to pass health care in cooperation with Republican leadership.